Libya's Retreating Rebels Dogged By Confusion Militarily, rebel fighters in eastern Libya are now effectively back to where they were when Western airstrikes began 12 days ago. Amid the retreat, tense and tired fighters seem unsure of what will come next. One even accused commanders of deceiving them. Rebels make a quick retreat from Brega as pro-Gadhafi troops fire heavy artillery behind them. Militarily, rebel fighters in eastern Libya are now effectively back to where they were 12 days ago when the Western airstrikes began. Troops loyal to Libyan dictator Moammar Gadhafi pushed rebel fighters into a headlong retreat Wednesday along the Mediterranean coastline that's become the ever-changing front line in the battle for Libya. Tense, worried and tired rebel fighters massed at the western gate of the small oil town of Brega, while the distant rumble of approaching mortar and artillery fire grew closer. Ali Jamal bin Hassouna, who had just retreated from the nearby town of Ras Lanuf, waved his arms and anxiously told a group of fellow fighters that what amounts to their leadership had deceived them. "The rebel commanders are betraying us," he shouted. "They told us the ammunition we had was enough so we moved forward. But it wasn't enough! They made us go into the fighting unprepared. They're playing a dirty game." A fellow fighter asked, "Are you sure about this? Are you sure?" To this, Hassouna shouted, "Yes, yes!" Ali Jamal bin Hassouna tells other fighters he feels betrayed by the rebel commanders. "I swear it's true. You haven't seen what I have," Hassouna said. "Our people were getting slaughtered before our eyes up there." Soon after, several ambulances with wounded fighters tore down the road toward a nearby roadside clinic. 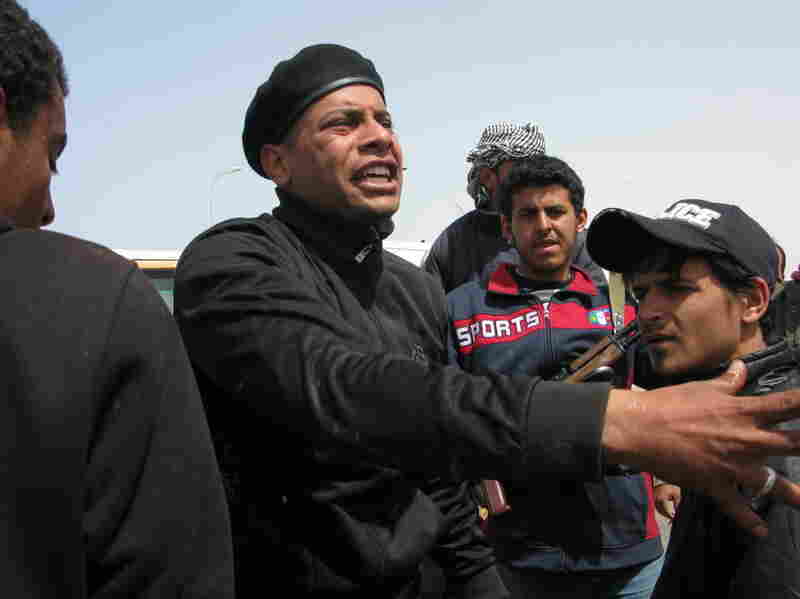 The insurgents fighting to end Gadhafi's 42 years of iron-fisted rule were again outgunned and outmaneuvered Wednesday. Rebel fighters have stuck largely to the main highway along the coast. Gadhafi's troops, some opposition fighters say, are now using new tactics: They're deploying small, mobile teams armed with mortars and small rockets, all backed by artillery. They are allegedly using nonmilitary vehicles, wearing civilian clothes and moving in from the desert flanks against the largely untrained and disorganized rebel gunmen. Mohammed Adrees, 26, fled Ras Lanuf for Brega early Wednesday. "We have to be ready for any moves from Gadhafi's troops, as they may turn around and come in from the desert at any time," he said. He added that he hopes French and allied fighter jets conduct more airstrikes soon. But allied airstrikes Wednesday did not seem to help the rebels near Brega and Ras Lanuf. 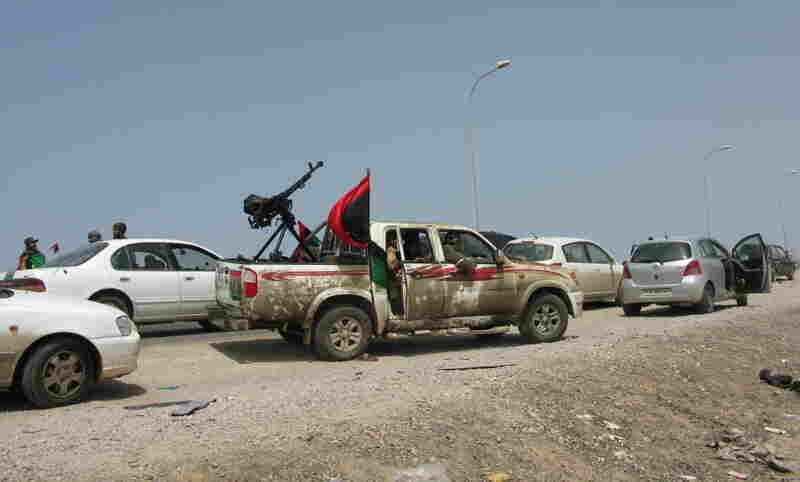 On Wednesday afternoon, mortar and artillery fire from Gadhafi loyalists edged closer and rebel fighters sounded the retreat. Soon, both lanes were jammed with rebel vehicles packed with fighters and their gear racing east toward Ajdabiya. Rebels gathered at the edge of that city. Many seemed confused and unsure of what would come next. "Of course I was upset to retreat," said Hamza Mohammed Sherks, 25, who was wearing a dirty blue camouflage uniform and a red beret. "I had to obey my commander's orders," he added. "He told us those with only AK-47 rifles should pull back." The fact is most of the fighters trying to oust Gadhafi have only AK-47s. There is a growing, sharp disconnect between leaders of the rebels' fledgling provisional government in Benghazi and the fighters in the field. In the rebel capital, officials are appointing ministers, holding news conferences and asking the West for lines of credit on seized Gadhafi assets. But their fighting force remains disorganized and ineffectual. As night fell, some civilians — who returned to Ajdabiya only a day or so ago — were seen fleeing the city in panic once again.